Mobile Handset over the counter and choose the mobile operator and use the SIM provided, but in this case we cannot be sure if the IMEI number is valid. You can check if the IMEI number of your mobile number is valid or not by visiting NumberingPlans and entering your unique 15 digit IMEI code can help find details about your phone like information regarding manufacturer, model type, and country of approval of a handset. Hi i got the result but how to get confirmation?? 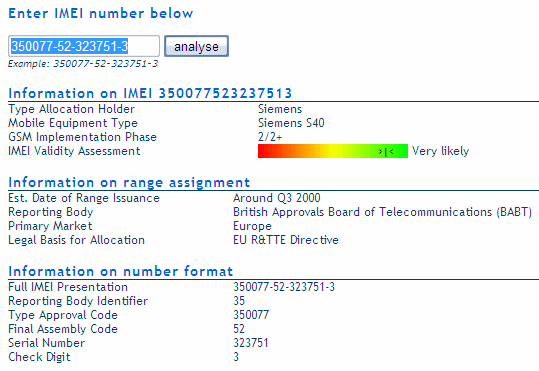 The result u got shows that its a valid imei no. @Ashish – You can try contacting a LG Service Center for your mobile. my phone imei number is 351541020122246. please inform the imei number is correct or not. my windows phone was stolen 1 month ago. i had registered a police complaint using imei number of my mobile.. now the problem is i am using NOKIA LUMIA 630 DUAL SIM i have only one imei no, i dont have another imei no. Inspector asking me another imei no . how can i get another imei..please help me..